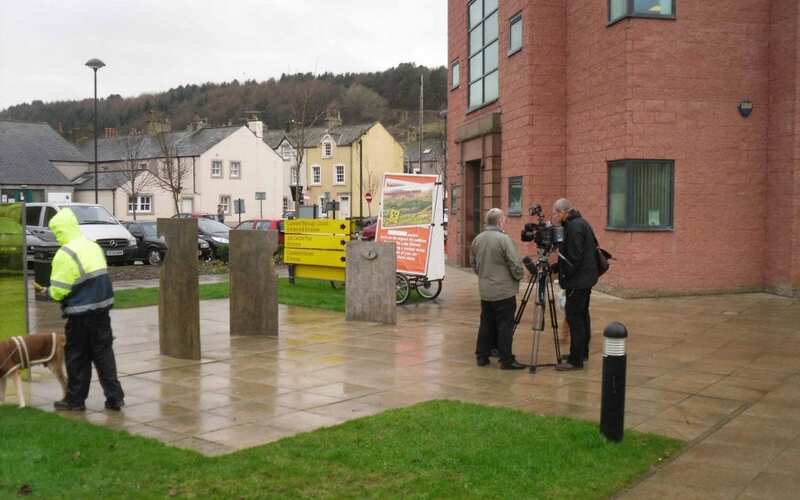 Lobbyist organisation ‘38 Degrees’ probably thought it was a long shot when they contacted Gorilla Media to provide 3 AdBikes with riders to be outside the Cumbrian Council offices the very next day. The objective was to influence council members as they entered the building before debating voting on the issue to allow nuclear waste to be stored underground in their area. The artwork was received at 3pm and banners met riders at Carlisle and were in position at the first location for 8am the next morning. The AdBikes and message reached a larger public when the AdBike banners were used as a backdrop to interviews on regional and national BBC TV coverage. “Logistically it was a bit of an undertaking” said the Gorilla Media operations director David Roberts“ with AdBikes coming from a job in Glasgow and banners and personnel converging at the 3 meeting points in Carlisle, Maryport and Whitehaven for this time-critical operation, but we pulled it off.” He went on to say “38 Degrees thought this must be some kind of record, but that honour stays with the Flybe campaign whose AdVan was in position for a press launch in Edinburgh 3-hours after receiving the booking”. Oh, and by the way, the vote was won and the Nuclear dumping in Cumbria blocked.